Households' financial assets fell by EUR 1.2 billion during the first quarter of 2018. 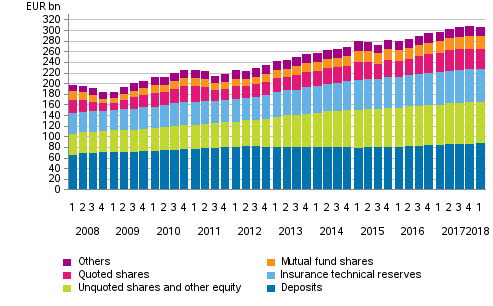 At the end of the quarter, households had financial assets, such as deposits, shares and mutual fund shares, to the value of EUR 305.7 billion. Over the same period, households had EUR 162.4 billion in debt, which was EUR 1.6 billion up from the previous quarter. As a result of these changes, the difference of households’ financial assets and liabilities, or net financial assets, decreased by EUR 2.9 billion to EUR 143.3 billion in January to March. These data appear from Statistics Finland's financial accounts statistics. The value of quoted shares held by households decreased by EUR 2.4 billion during the first quarter of 2018. Mutual fund shares also generated holding losses of EUR 0.4 billion. The positive value development of unquoted shares and other equity evened out the decrease so that, as a whole, households’ holding losses remained at EUR 2.4 billion. Households’ net investment flow was EUR 1.2 billion over the same period. Households purchased quoted shares to the tune of EUR 1.0 billion on net. Changes in other instruments were minor. At the end of March, households had EUR 148.8 billion in housing loans and other loans, which amount increased by EUR 0.4 billion from the previous quarter. However, households’ indebtedness ratio declined by 1.2 percentage points from the previous quarter to 127.2 per cent, as households’ disposable income grew more than loan debts. Households' indebtedness ratio is calculated as the ratio of their loan debts at the end of a quarter to their total disposable income during the preceding four quarters. Non-financial corporations’ debt financing increased by EUR 3.0 billion during the first quarter of 2018 to EUR 239.2 billion. Debt financing refers to corporate loans, as well as commercial papers and other debt securities issued mostly by large corporations. A majority of the growth came from loan debts that increased by EUR 2.8 billion from the previous quarter to EUR 209.3 billion. In addition, financing in the form of debt securities grew by EUR 0.2 billion so that it amounted to EUR 30.0 billion at the end of March. Here, the non-financial corporations sector does not include housing companies or other housing corporations. ISSN=1458-8145. 1st quarter 2018. Helsinki: Statistics Finland [referred: 22.4.2019].